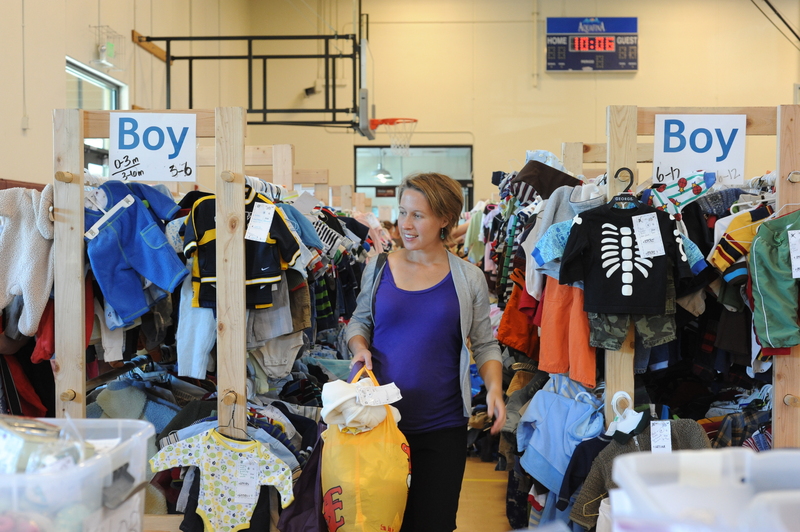 This coming weekend is the 9th annual Half-Pint Resale, the area’s largest (and local) children’s consignment sale. With only a few days left before the sale, we hope you’ve got your resuable bags ready and your cheat sheets complete. 1) Volunteers will be wearing black and will be wearing nametags. They are here to help you! There are a couple of volunteers with special duties that will really help you out: Volunteers in the GEAR AREA will help you purchase large items so you can easily purchase them without hindering the rest of your shopping experience. Volunteers with a ASK ME ABOUT BABY CARRIERS sign on their backs are ladies who know a TON about baby carriers and will be hanging around in that area during a few hours of the sale to help you try carriers on and learn about what will be best for you and your baby. We hope that these folks will help make your shopping experience better. 2) There are two main areas at the Madison Curling Club. In the lobby area, there are tables, seats, and places to just take a load off! There will even be some folks selling food (and cupcakes!) on Saturday and Sunday (yumyum). The sale area is in the arena part of the building. 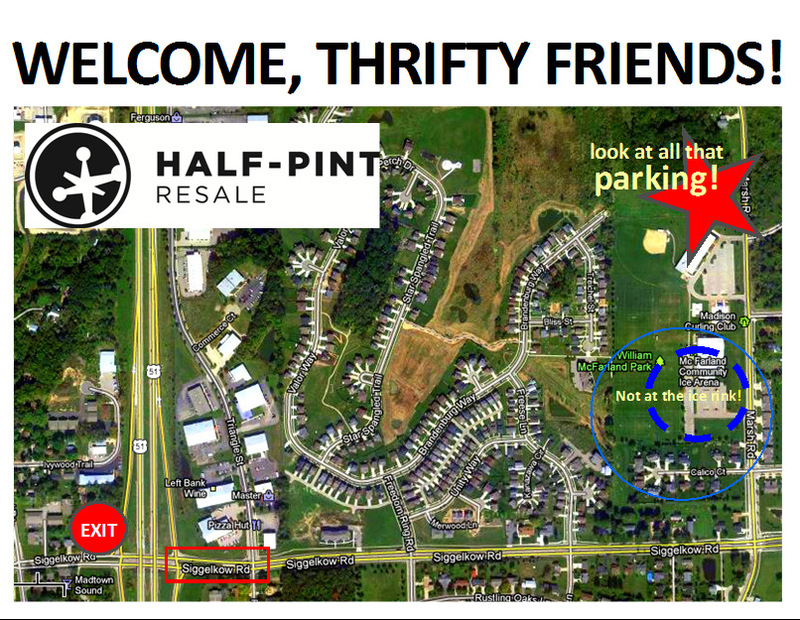 Once you head into the sale area, you will not be able to bring any merchandise with you back into the lobby area. We will have hold tables where you could bag your items, if you say, need to go sit and nurse your babe or use the restroom (or get a sugar fix!). NOTE: The temperature in the sale is similar in temperature to the temperature outside. Need to warm up? The lobby area is for you! 4) Strollers are NOT allowed during peak shopping times (anything before Noon on Saturday). It gets so crowded and it would be unsafe for everyone. We also highly recommend you not bring children. We know – sometimes you have no choice! But we’ve had several kids get lost (think kids shorter than the racks and at some peak shopping times, several hundred people packing the space). Finally, Children of any size that are WORN in a carrier are ALWAYS welcome, anytime! If you do bring kids, please make sure that they aren’t playing with the toys or sitting in the gear. We’ve had kids break things which they become unsellable. Thanks for understanding! 5) Like the last sale, there will not be an Express Lane at this sale... I don’t imagine there are too many people saying boohoo because for those of you who have waited in that Express Lane earlier in the sale when the lines are longer, you know that it didn’t actually get you through any faster and was hard to manage. We will continue to manage lines as best as possible and think you’ll find our bagging system swift and our hard-working volunteers fabulous. 6) Check out all of our tips about holding items on our shopping tips page. Remember that items can stay on the Hold table for one hour maximum. PLEASE! Don’t abandon items on this table! Shoppers and consignors alike miss out! Saturday, April 21- 9am-9pm (new longer hours! ), and Sunday, April 22- 8am-1pm when everything is half off!